When I received an email a few days ago with a request for help in making over a family favorite recipe, the plea was “I need it to taste good.” As I finished reading the email, I thought about the number of times I’ve made something that “didn’t taste good”. Really. I know it’s hard to believe, but in all my years experimenting, only once has something come out so badly that I couldn’t eat it. All the other times, the texture and/or taste may not have been exactly as I wanted, but it’s always been edible and/or fixable to be edible. I share this, because worrying about how something will taste can be paralyzing. The only thing we can do is to simply forge ahead and see what happens. Might it be less than perfect? Sure, but will it be such a disaster that you can’t serve it? Most likely not. The request received was about a banana sheet cake which the family has always enjoyed. Unfortunately new food allergies have hindered the mom’s ability to make the cake anymore, and she was wondering whether it was possible to recreated it. The answer, of course, is “yes”, but the caveat is that the cake will obviously be different once you make the adjustments. I took a stab at making over the recipe over the weekend, and the result was something that my family liked very much. Below I’ll explain what I did and other possible ways for recreating the recipe. 2 1/2 cups sugar, 1 1/2 cup vegetable oil, 2 tsp vanilla, 4 eggs, 5 cups flour, 2 tsp baking soda, 1 tsp salt, 1 1/3 cup buttermilk, and 2 to 3 mashed bananas — all of which combines to make an 11 x 15 sheet cake. 1. The Flour: This mom needed the recipe to be gluten free. Here’s the tip: Banana cake can be dense, so if you’re going to use a gluten free flour blend, you should opt for something that is lighter like a brown rice flour blend as opposed to a heavier flour like a garbanzo bean flour blend. For this makeover, I used Authentic Foods Gluten Free Multi-Flour blend because it’s a lighter flour and already has the xanthan gum mixed in. If you use a blend that doesn’t have the xanthan gum, be sure to add it in: 1/2 tsp per cup of flour. If you don’t need your cake to be gluten free but you’d like to make it a bit healthier, opting for a white whole wheat flour will make for a more fibrous but still light cake. Otherwise, you can use a whole wheat flour which works well but will give the cake a slightly denser texture and a nuttier taste. 2. The Sugar: This mom didn’t care about replacing the sugar, but since I try to avoid as much refined sugar as I can, I’m letting you know that you can replace the sugar in a one to one ratio with coconut sugar or use half as much of the called for sugar by replacing it with Agave or Stevia. If you use the dry options (coconut sugar or Stevia), you don’t need to adjust any of your other ingredients. If you use Agave, though, you should either increase your flour by 1/2 cup or decrease your liquids by 1/2 cup. I chose to use Agave and decreased the oil which decreased the overall fat for the recipe. 3. The Vegetable Oil: I always suggest replacing vegetable oils with an oil like olive oil or safflower or grapeseed or a blend like Smart Balance because the fats are considered good fats. I also like to reduce the fat if at all possible. For this recipe I used a Mediterranean blend of olive, grapeseed, and canola oils, and I reduced the oil from 1 1/2 cups down to 1/2 cup since I was increasing the liquids with the use of Agave. 4. The Eggs: This mom didn’t have any egg allergies, so I kept the eggs, but to decrease the fat and cholesterol, I opted to use liquid egg whites instead of whole eggs. If you have an egg allergy, though, I’d recommend using ground flaxseed meal mixed with water. You use 1 tbsp of flaxseed meal mixed with 3 tbsp of water for every egg you replace. Let the mixture sit for at least five minutes so it can thicken. Because this cake calls for buttermilk, omitting the eggs and replacing it with the flaxseed mixture will actually work quite well since the acid in the buttermilk will help with the leavening you lose from the eggs. 5. The Buttermilk: This mom needed to avoid dairy so I chose to make a nondairy buttermilk. I used flax milk but you can use any type you prefer like soy or rice or almond or coconut milk. To make your own buttermilk, simply mix your “milk” with one tablespoon of an acid per cup of milk. For the acid I prefer to use either lemon juice or white or apple cider vinegar. Mix the lemon juice or vinegar with the milk and let it sit for about five minutes to thicken before using it in your recipe. 6. The Sodium: Since I always try to reduce salt use, I cut the salt in half and decided to add some other spices instead like cinnamon, nutmeg and ginger; and because I added the spices, I decreased the vanilla to 1 teaspoon, but you can even omit it altogether if you like. 7. The Bananas: Since the recipe called for bananas by amount, I decided to change it to a measurement. 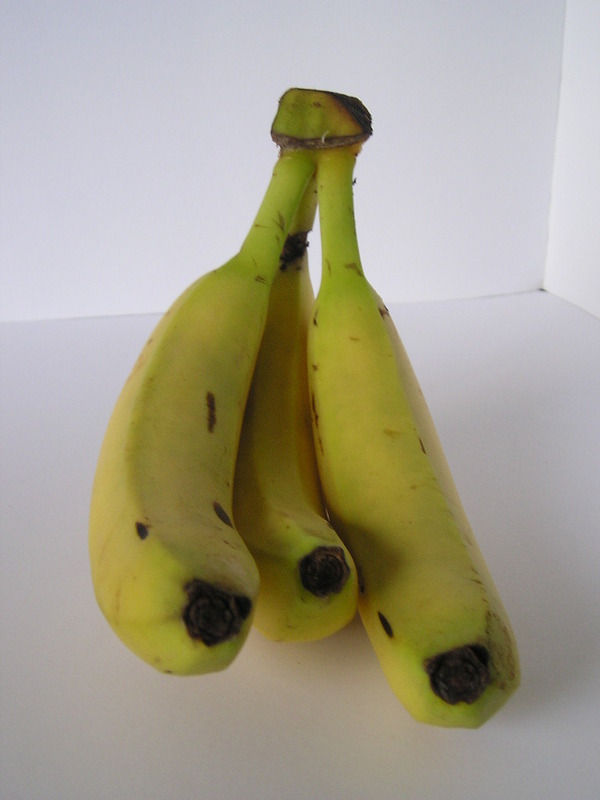 If you simply say 2 to 3 bananas, the question becomes, “What size banana?” and the size is important because your entire recipe can be messed up if they meant two to three small bananas versus the larger sized ones you normally find at the store. Working off my knowledge of most banana recipes, I figured about two cups of ripe mashed bananas would be good for the recipe. This worked out to 5 5 inch in length bananas. 8. The Additions: Banana cake is not actually a favorite for two of my three children, so I decided that if I was going to make this, I would need to liven it up a bit. To do so, I chose to add some allergy friendly chocolate chips, but I didn’t want to have actual chips affecting the texture of the banana cake. So, I put the chocolate chunks into my food processor and processed them into pieces smaller than mini chips but not quite ground up, which I mixed into the flour mixture. The result was quite tasty. 9. The Topping: The original recipe simply said to frost with a cream cheese frosting, but my children aren’t fond of cream cheese frosting. Instead, I used a chocolate frosting recipe from Elana’s Pantry (www.elanaspantry.com) to top the cake instead. Since I had put the chocolate pieces into the cake, I figured chocolate frosting would top the cake well. 1. Preheat the oven to 350 degrees. Line a 11 x 15 pan with parchment paper. Set aside. 2. Mix the flour, baking soda, salt, cinnamon, ginger and nutmeg well. Combine the processed chocolate pieces with the flour mixture. 3. Mix the mashed bananas, flax milk, oil, egg whites, Agave, and vanilla together. 4. Mix the dry ingredients slowly into the wet ingredients until they’re combined. Give the batter a quick stirring for about 30 seconds to make sure everything is well mixed. 5. Carefully spread the batter into the pan and bake for about 35-40 minutes. The cake will be puffed and golden when it’s done and a toothpick inserted in the center will come out clean. NOTE: Because of the Agave, the cake may brown more quickly than you’d like. About halfway through the cooking time, you can always place a piece of foil or parchment paper lightly across the top to prevent darkening of the cake. 6. Cool the cake completely in the pan on a wire cooling rack. When cooled frost with your favorite frosting. Surely you don’t mean 214 tsp baking soda… 😉 This recipe sounds divine! I figured…. 😉 sounds yummy!